I started off the day just fine! I’d had a nice evening and was looking forward to the day. I have a commission I’m working on that is nice and challenging, ( an odd proportion), and a student coming later in the day whom I very much enjoy working with. I had just enough on my plate to make it an interesting day without too much craziness. I’d taken care of many of the tedious details for the week, yesterday. All good! Then, things went a bit a wry. 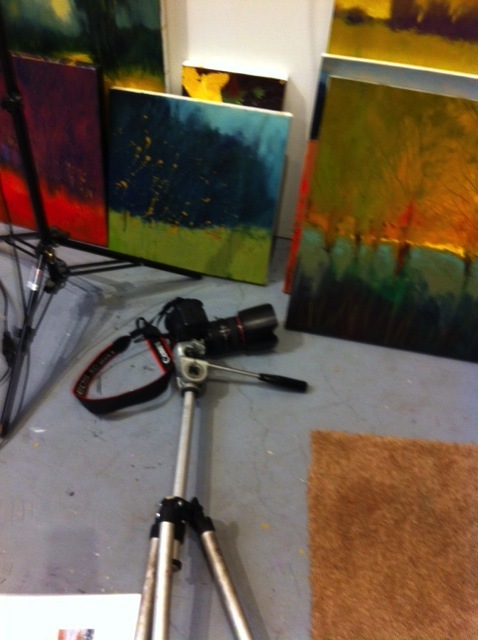 While moving some canvases to prepare to gesso, a stack fell over and hit my tripod and camera. Down went the camera on the cement floor. I wasn’t too hopeful and sure enough, it wasn’t good!! Well, how to make the most of this??? That camera was awfully big for me. I was used to my old camera. I love the name Nikon much better than Cannon?? I’m itching to read new owners manuals?? I love shopping for new equipment?? Tired of painting and want to spend money?? I’m trying!! A busy studio with lots going on, constantly in flux and a bit of chaos thrown in. Life is good. A broken camera is not a broken arm or leg. Just stuff. Off to Camera Solutions!